Football is probably the most popular sport that you will find, with hundreds of millions watching it and rooting for their teams. Football Fever celebrates this sport and what it offers its fans. The slot was created by BetOnSoft/Saucify and it might not look like the best football themed title you will ever see, but thanks to its features it’s still worth a spin or two. It’s one of the few slots from Saucify which offers 243 ways to win. The game has the usual 5 reels though, with wild symbols on them, with scatters of two types, with free spins, tripled wins and bonus games. The prize has an unusual top value, being worth $4,687.50. 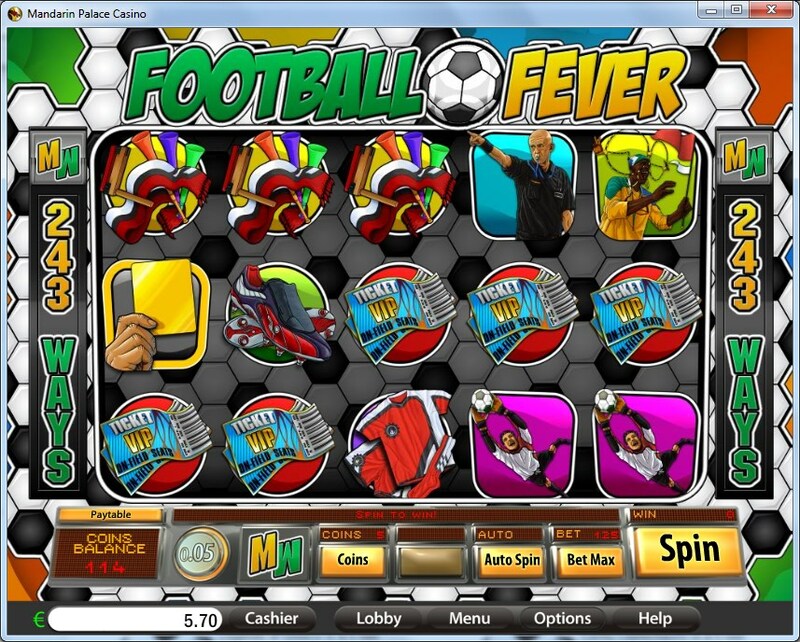 If you take a look at the features of Football Fever, you will find among them free spins, scatter symbols, multipliers, a Penalty Round feature and wilds. The Max Ways system is called this way by Saucify, but other slot developers will call it Ways to Win. It’s the same system, with 243 ways to win offered on 5 reels, where instead of paylines which need to host the right symbols, all you need is for the right reels to have them. You can form combinations with symbols that go from left to right, on adjacent reels. The Soccer Ball is reserved for the role of the wild feature. There is nothing out of the ordinary about it. Just like most wilds can, it will substitute only for regular symbols, and it can also get its own combo formed, if three to five Soccer Balls lands on adjacent reels. Payouts of up to 750x are possible in this case. Two scatter symbols are present as well. The Freekick symbol is used to trigger the free spins, but also to give you some cash prizes. They start at 5x the bet when two scatters are anywhere on the reels, but they go as high as 150x the bet when five are there. 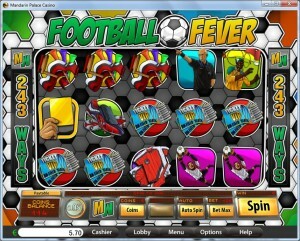 You can win 5, 10 or 15 spins for free, as long as you have 3, 4 or 5 Freekick scatters present. They come with tripled wins, plus the ability to retrigger the free spins in the right conditions. Started when the Yellow Card scatter appears with 3+ symbols on the reels, the Penalty Round is a bonus game where you get to do just that, execute penalty shots and get paid when you score. You are forced to use a minimum of 25 coins at all times, which is enough to activate the 243 ways to win. You can increase the line bet from the minimum of $0.01 (smallest coin value), to $1.25 (for five coins of $0.25). You have total bets of up to $31.25 this way. The best possible prize doesn’t come from the wild (750x), but from the scatter symbol, which pays 150x the triggering bet. That’s a top payout of $4,687.50. 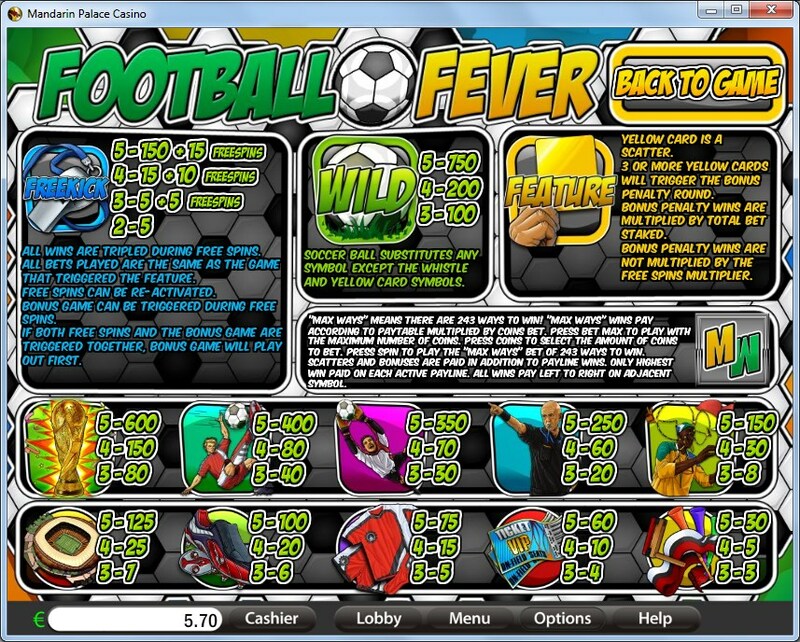 The design of Football Fever appears to be very busy, with lots of things going on at the same time. The background is filled with soccer balls, arranged like some sort of puzzle. The reels have themed symbols only on them, but I’m not a huge fan of the way they were drawn. Overall, it’s a game that you will not play because of how good it looks, but because you’re a fan of the sport. Symbols: Soccer Ball (wild, 750x), Yellow Card (scatter), Freekick Whistle (150x the bet, scatter), Gold Cup (600x), Player (400x), Goalkeeper (350x), Referee (250x), Fan (150x), Stadium (125x), Boots (100x), Equipment (75x), VIP Ticket (60x) and Fan Noise Makers (30x). It’s a game for the fan of football, which maybe even attended one of the matches from South Africa’s World Cup. Its design isn’t the best you will see in this category though. You will find Football Fever at any online casino which chooses to use software from Saucify/BetOnSoft , playable either for free or for real money.